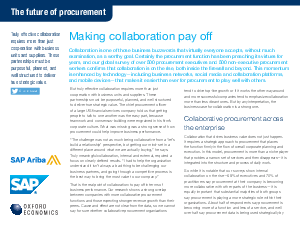 Download this in-depth think piece to find out how increased collaboration can help reshape your procurement function. You’ll learn how collaboration is on the rise within organizations and outside the firewall. You’ll discover how more than 1,000 procurement executives and practitioners worldwide are practicing and benefiting from new levels of collaboration. And you’ll get insight into which technologies and operational changes are supporting these changes.